McKenna was born full term on July 20, 2011. She has a brother, Ryley, who is just 21 months older and adores his little sister. My pregnancy was normal other than gestational diabetes. Both McKenna and Ryley had shoulder dystocia when they were born, which made for stressful deliveries, leading to low Apgar scores at first, but fine after a few minutes. We were discharged from the hospital with a beautiful, healthy baby girl completely unaware of any underlying developmental issues. At McKenna’s four month checkup, her head circumference had gone from the 10th percentile at birth to the 5th percentile. The pediatrician said we should keep an eye on that. We thought that was a strange statement – we had no idea what the implications were. At that same checkup, the doctor gave us a referral to see an ophthalmologist who diagnosed McKenna with esotropia (a form of strabismus causing her eyes to cross). We did eye patching and atropine drops and her vision improved over time, but her eyes continued to cross. In 2015, she had bilateral eye muscle surgery to correct the misalignment and we’ve noticed a significant improvement. In 2016, she was diagnosed with a slight astigmatism and prescribed glasses, which she now wears on a regular basis (and actually keeps them on!). At McKenna’s 6th month checkup, she was not hitting her developmental milestones. Her doctor diagnosed her with hypotonia (low muscle tone) and microcephaly (small head) given that her head circumference had dropped below the 3rd percentile. We were referred to a cranio-facial doctor to see if her skull sutures had closed prematurely (a condition called craniosynostosis). Those two appointments were probably the toughest for our family – having our world shattered with the reality that there was something very serious going on with our daughter’s development. The cranio specialist did not think her sutures were closed and referred us to get an MRI, which showed that she had no evidence of infarct, mass, hemorrhage, hydrocephalus, or enhancing lesion. This was very good news, although they did confirm she had delayed myelination. At that point, we immediately started physical therapy for McKenna and met with a pediatric neurologist who ordered a CT scan of McKenna’s skull along with some initial genetic tests (microarray and MECP2 to test for Rett Syndrome). The CT results came back confirming that her sutures were still open and her brain was not growing at the rate it should. Also, her blood work came back normal and ruled out Rett syndrome. We consulted a second neurologist who encouraged us to continue with early intervention and referred us to a geneticist. Our geneticist ordered a variety of metabolic and genetic tests including testing amino acids, thyroid, ASPM sequencing to test for MCPH (primary microcephaly), ASPM Deletion/Duplication analysis, lactate, and Congenital Disorders of the Glycosylation (CDG) testing. All tests came back normal. Finally, we worked with our geneticist to build our own gene panel for McKenna that included the MCPH Tier 2 panel as well as about 75 other genes known to cause developmental delay and/or intellectual disability. We waited nearly six months for the results of the customized gene panel. On February 10, 2014, after two years of testing, we were told that McKenna has a mutation on her FOXG1 gene (her specific mutation is c.136dupC frameshift mutation). It is considered a single-point mutation that occurred spontaneously given that neither her father nor I exhibit the characteristics. Finally, we had an answer and there was no more wondering – it was a lot to digest especially given the severity of the diagnosis. FOXG1 syndrome is extremely rare and McKenna’s specific mutation has never been seen before. It is described as a “severe neurological condition characterized by seizures, small head size, inability to control body movements, and lack of speech. The majority of FOXG1 children cannot walk or talk. They cannot feed themselves and they struggle to communicate their most basic needs.” After hearing this, we were devastated. The day we received McKenna’s FOXG1 diagnosis, I reached out to the International FOXG1 Foundation’s Parent Support Group on Facebook and discovered an amazing network of families each with a child or children with FOXG1 syndrome. This group has been an amazing support system and resource especially for parents of a newly diagnosed child. Overall, McKenna is a very healthy and happy girl. She just transitioned into full day Kindergarten at a local elementary school in an Intellectual Disability (ID) classroom. She is non-verbal, but her vocalizations have recently increased including a few words on occasion (more and cookie!). McKenna is able to communicate her likes and dislikes through her personality, emotions, and eye gaze. She enjoys school and is actively engaged in learning and exploring the classroom, our home, and the world around her. At the age of 5 she had her first seizure and she struggles with sleeping through the night, which makes it tough for our entire family, but we are so fortunate for the things she can do. She eats by mouth, can sit independently, transitions to sitting, walks with assistance in her gait trainer (300+ feet at school), is able to stand very well with support for balance, and started crawling at the age of 4. 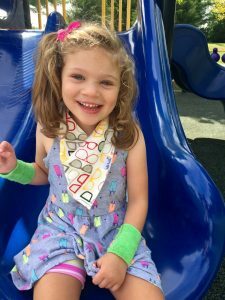 Now that we have the FOXG1 diagnosis, we are more determined than ever to keep up with McKenna’s therapies, which include physical therapy, occupational therapy, and speech therapy provided through the public school setting (which she started at the age of 2). McKenna also receives private hippotherapy and music therapy, and in 2016 enrolled in a 5-year Natural History Study for Rett and Related Disorders (which includes FOXG1) at the Children’s Hospital of Philadelphia. She is one very busy girl! When all is said and done, we focus on the joy she brings to our lives and choose to move forward. We are very hopeful for her future. Thank you so much for reading her story…it’s just the beginning!